Something’s being lost in the battle of the pre-K plans. New York City Mayor Bill de Blasio won his election based in part on his proposal to fund universal pre-kindergarten with a tax on the city’s top 1.4 percent of wage earners. Governor Andrew Cuomo has countered with his own proposal for universal pre-K, which would cost much less and—surprise!—wouldn’t require potential campaign contributors on Wall Street to pay a dollar more in taxes. Meanwhile, President Obama has reiterated his call for publicly funded pre-K accessible to all, and commentators wielding reams of data are debating the merits of the idea. The benefits of Head Start to poor children diminish after the first grade, skeptics warn. The long-term gains from free pre-K for all children have been oversold, they say. Supporters argue, on the other hand, that it is essential to ensure that the new pre-K slots are high-quality ones—the kind that, according to one study, produce returns of 7–10 percent on every $1 in annual government spending, thanks to the lifelong earnings bump enjoyed by their 5-year-old graduates. It’s a reasonable concern, as far as it goes. It clearly makes sense to invest in social programs that yield social and economic benefits far into the future. And quality is important, as parents count on schools not only to keep their children safe but to help cultivate the knowledge, habits and skills that will enable them to thrive for the rest of their lives. Finally, it’s tactically wise for liberals to speak the language of metrics and outcomes, lest we be accused of throwing money at a problem. Sometimes, though, money is exactly what a problem needs. Here’s the thing: the problem that universal pre-K programs address is not simply the need for more enriching early childhood education. The bigger problem is the huge and growing gap between the rich and everyone else—the “tale of two cities” that de Blasio talked of frequently on the campaign trail, and that has made living in New York difficult for most families. It’s true that those problems are linked in a way that makes universal pre-K an appealing proposal. The hope is that the boost of a good early education will vault more low-income kids into the middle class and loosen up the economic hierarchy that has ossified in this country in recent decades. The preponderance of data on pre-K outcomes suggests this might happen, if the new programs are staffed with great teachers and are funded generously enough to allow the small class sizes that matter so much in the early years. But de Blasio’s plan, in particular, is designed to exert a more certain and immediate impact on inequality by offering relief to ordinary working parents, for whom private preschool—which runs some $20,000 a year in New York City—is unaffordable, and asking the city’s most prosperous residents to pay for it. 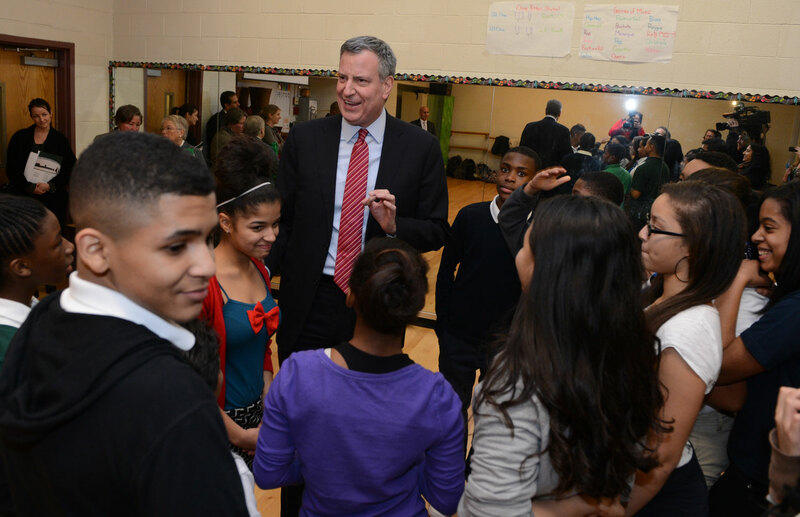 It’s not often mentioned that the mayor’s plan also includes universal afterschool for middle schoolers, filling another urgent need for non-rich New York families. In this way, the de Blasio plan is less a data-driven long-term intervention in the “great divide” than an attempt to achieve wealth redistribution in the here and now, in a city that sorely needs it. The economic benefits of such an investment will be felt long before any that may arise from a spike in poor kids’ future earnings. After Quebec instituted a low-cost universal childcare program, so many women entered the workforce that the province enjoyed a $5 billion rise in GDP in 2008. And the program more than paid for itself in tax revenues. It has become fashionable to lament income inequality, and even more so to decry our lack of social mobility. Investment in early childhood education is presented as a response to these related problems that everyone can love, because it promotes opportunity for poor children, which even conservatives can get behind. But universal pre-K and childcare can most powerfully address both inequality and mobility if these programs are financed by an increase in taxes on those who can most easily afford to pay a little more. Done right, this could be a model of sound economics as well as economic justice. That’s why the fate of de Blasio’s plan matters in New York, and why the rest of the country should pay attention.